Should this be the Uber driver’s car of choice? My first sighting of the Toyota C-HR in the flesh was in Portugal earlier this year. I was walking through a car park in Lagos when my eye caught a series of gleaming, angular lines protruding out between a couple of far more sedate sedans. I tugged at my partner's hand to indicate that I required a closer inspection of this mystery machine. We approached, and I grunted my approval as I paced around its perimeter. The sharp lines, the sporty rear complete with wing and the adventurous front reminding me of a rodent keen on exploring its surroundings, had certainly got my attention. I notice the badge above the front wheel arch. 'Hybrid', it read. My eyebrow raised. This looks rather good for a hybrid, I thought to myself. Then I felt a tug on my hand… it was time to head to the beach, so I made a mental note of the model name and trotted off, the slapping sound of our flip flops signaling to the locals that the British were on their way. 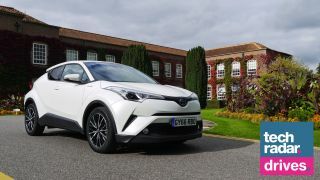 With my interest piqued, I got in touch with Toyota on my return to Britain, eager to find out what the C-HR was like to drive, and it's surprising. The Toyota C-HR does something that many hybrids at the affordable end of the market have arguably struggled to do. It's thrown off the rather dusty 'Uber driver's car of choice' image and given us a car that looks decidedly futuristic and desirable. The C-HR falls into the extremely popular SUV category, albeit at the smaller end of the scale - which makes it better for city driving (and parking), while also still seating five adults reasonably comfortably. Its sporty style front seats are comfortable, and the raised ride height of the C-HR gives an improved view through the windshield. The textured door panels and roof lining bring the funky exterior details inside the cabin, and while spacious in the front things feel a little tighter in the rear seats thanks to the small passenger windows. It’s the main rear window which feels just a little too small though, with the chunky roof pillars either side creating sizable blindspots. In reality it means a more liberal use of your wing mirrors are required when parking in tighter spots, but its size will likely put a few people off. The silence that greets you when the start/stop button is pressed still unnerves me slightly - is the car even on? Thankfully the large center console display, and the small 4.2-inch screen tucked in-between the instrument clusters show there is life here. Acceleration is smooth, and the C-HR gets up to speed at a good pace. It's not going to electrify you with performance, as it's 0-62mph in 11 seconds shows, but it's also no slouch. At low speeds the C-HR slips seamlessly into EV mode, with a small green icon illuminating on the dash to let you know you're in planet saving mode. I found the C-HR was more comfortable at sitting in EV mode for longer periods than the sportier, pricier Lexus RC 300h I had driven a few weeks previous. It means gentle acceleration around town could well result in short journeys that don't require the petrol engine at all. If you're really feeling green, there's an EV Mode button just below the electronic handbrake switch and gear shift allowing you to only utilize the C-HR’s battery. It's only useful for short, low speed trips, but is a handy fuel saving option. You can keep of your green credentials on the 8-inch display that extends from the top of the center console. From here you can see when the car is using the battery or petrol engine, and keep an eye on your MPG (miles per gallon) - handy if you're trying to drive economically. It's not just vehicle stats though, as this screen also doubles as your infotainment interface, with Bluetooth connectivity for smartphones allowing you to make and receive phone calls, read text messages and stream music to the car's punchy JBL sound system. There's satellite navigation too, which is easy enough to operate, although it's not as feature rich as the versions found in Audi's or even your smartphone. While it comes with all the core tech you'd expect, including auxiliary 3.5mm and USB ports hidden under the driver armrest, the on screen experience is slow. Everything took a little while to load, which detracted from the overall experience. A slicker interface would have made the C-HR an even better car. Something to build on for 2018’s revision then. Overall though, the Toyota C-HR now was me pondering whether my next car could well be a stylish hybrid. If Toyota can tidy up its infotainment, this could become a full-blown love affair. John McCann is getting behind the wheel to give you an alternative look at the wealth of cars - and the tech inside them - available today. From superfast sports cars to tech-packed hatchbacks, he'll take you through a range of makes, models, power and price tags in his regular TR Drives column.